It’s been a while since the last update on the Stretford Cycleway. While the work on Stretford Road and Talbot Road is complete, progress has continued on the Westpoint junction, which was just under way at the time of my last update. As you approach the junction from Talbot Road, you can see the newly constructed island, at the point where the protected cycleway starts. From here, bikes go to the left of the island and across the traffic lane from Chester Road. The designs include a completely unnecessary stop line in the cycleway. Given that cycles should be leaving Talbot Road on the same phase as motor traffic, why is a stop line required? If anything was needed, then give way markings should have been included on the traffic lane from Chester Road. Once across the Chester Road junction, the protected cycleway continues. In the original plans, this section was due to have continuous kerb protection. This has now been changed, so that the kerb protection is be split into sections, with the sections in between filled with Wand Orcas. With Wand Orcas being cheaper to install than kerb protection, this seems to makes sense. Also, it may mean that more space is available for the cycleway, which on the whole, is narrower than it should have been. At the Stretford Road junction, the cycleway widens a little to allow cycles to either continue forward on Chester Road, or turn right onto Stretford Road. It’s noticeable how sharp and narrow the right turn is here. I suspect this is a deliberate attempt to slow cycles down. Though I can see it causing problems, either to those riding non-standard cycles or when there’s a queue of riders. The right turn here has its own set cycle traffic lights. The timing of these lights will make or break the popularity of the cycleway through the Westpoint junction. If riders are forced to wait too long to cross the junction, many of them will choose to ignore the cycleway and ride on the road. Crossing over Chester Road, you reach the start of Stretford Road, where there’s a new kerb protected section. This is a big improvement on what used to be a tight and unpleasant corner. Especially with motor vehicles often doing quite dangerous close passes to get past you. From here, the cycleway joins the completed Stretford Road cycleway with its Wand Orcas. There isn’t as much work being carried out on the outbound side of the junction, mainly because it wasn’t anywhere near as bad as the inbound side. Also, the outbound route doesn’t involve making a right turn or crossing a large junction like the inbound side does. There was already a cycleway leaving Stretford Road, which was generally okay, except for the corduroy paving, which could be tricky to negotiate. 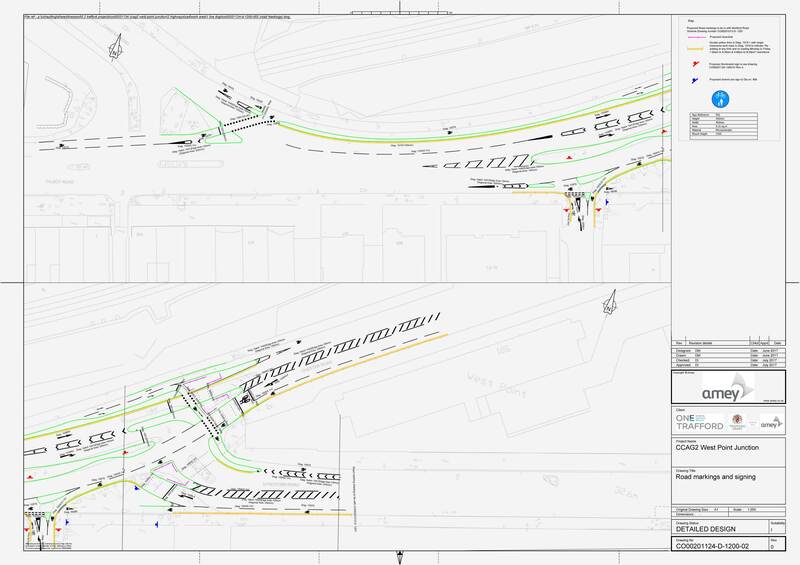 The main issue was where the cycleway rejoined the road, due to the conflict with the Carver Street junction. While this appears to be improved a little in the proposals. There’s completely unnecessary give way markings on the cycleway leaving Stretford Road. These markings just lead to confusion as to who has priority at this junction. It’s good to see progress on the Westpoint scheme, even if it has been pretty slow going. There’s enough here to get an impression for how the cycleway will work, once it’s complete. While it definitely could have been wider and not so awkward, it will still make this junction safer and more pleasant to negotiate. Seeing cyclists cycling in the main road to pass other cyclists on the cycleway make the whole scheme an expensive nonsense. Being a cyclist myself, using the Bridgewater canal makes my journey a mile longer than the A56/Talbot Road route but, at least it is so much safer, although better lighting would be appreciated. The council have gone about this in totally the wrong way, and certainly to the detriment of cyclists in the view of motorists. Thank god they weren’t in charge of Brexit!